Conveniently located across the street from the Gulf of Mexico, this townhouse sits directly on Santa Rosa Sound’s Little Sabine Bay, with beautiful views from all bedrooms and living areas. Downstairs there is open access to the backyard, where you can walk along the water’s edge and enjoy the beautiful view. The first level features an indoor sitting area with a full wall of windows to view the quiet waters of Little Sabine Bay. There is a sleeper sofa, TV, and four custom built-in twin bunks. This is a comfortable and roomy second living/sleeping space often not found in a townhouse. The 2nd (main) level has the kitchen in the middle, dining room plus sitting area on the gulf side and a larger living room with glass windows from floor to ceiling on the sound side. Every direction you turn there is an amazing view! This floor plan also provides two distinct zones so you never feel crowded in the space. There is more than enough room for watching TV, playing games, and enjoying meals together! The 3rd floor has the 3 private bedrooms. Two of the rooms have a queen bed and provide an beautiful view of the sound. These two bedrooms have a shared hall bath. The master bedroom is also located on this floor and has a king bed and its own private bathroom. There is an amazing gulf view from this bedroom! This townhome is a great beach destination for those who want the full beach experience. There are community boat slips available so bring your boat right to the back yard! 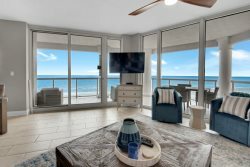 The Gulf of Mexico is just steps out the front side of the town home with a great beach access point to a low density beach! The water of Little Sabine just steps out the back door are great for fishing, kayaking, paddle board and boating. Come checkout this unique gem for the best of what Pensacola Beach has to offer! We were very pleased to work with Gulf Coast Getaways. They were friendly and helpful! Our family would feel confident working with them each year to secure a great family summer vacation spot. This property was perfect for our family. It was neat and clean and just like the pictures/description. It was a lovely home, but also comfortable and our entire family felt welcome.